Molton Brown has launched Suede Orris, a new powdery fragrance. London via Florence: Pure, precious orris absolute ground into a cloud of powdered perfume. The creamy caress of couture suede gloves on feather-soft skin. Threads of jasmine and rose absolutes, embroidered in a concealed lining. Enwrap yourself in endless sensuality. An opulent fragrance from Molton Brown with precious notes of Tuscan orris, rose and jasmine absolutes with sensuous undertones of cedarwood and mandarin. Additional notes include olibanum, elemi, labdanum and patchouli. 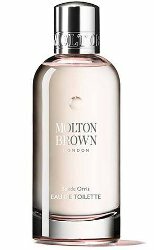 Molton Brown Suede Orris is available now at John Lewis in the UK, in 50 and 100 ml Eau de Toilette or 100 ml Hair Mist. Update: Suede Orris was developed by perfumer Jerome Di Marino. This might be worth a sniff. Love Russian Leather and some of the others are pretty good. They do seem to be stepping up their game, and they’ll have another (I think earmarked for men) this spring, then a new range of EdPs (plus repackaging of the whole fragrance line) later in the year. Oh, I’ll keep Russian Leather in mind then. I may have just been lemminged. I’ll add this to an order to reach a minimum purchase. Thank you for posting this, Robin, I definitely want to try it. I wore a lot of Ylang-Ylang, this summer, I find it quite similar to Guerlain AA Ylang-Vanille; I often wear Rosa Absolute; another favorite is Intoxicating Davana Blossom, perhaps not to the level of real intoxication but a very unusual floral.